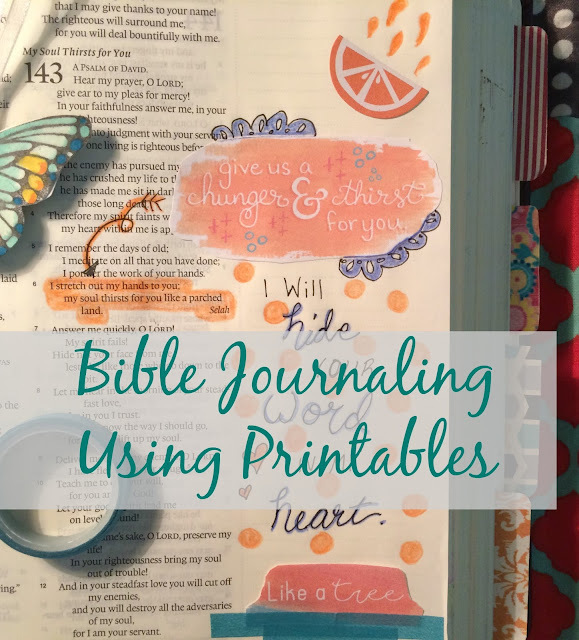 As you know, I love to spend time in my Bible creating beautiful illustrations and recently I shared how I use washi tape in my journaling. 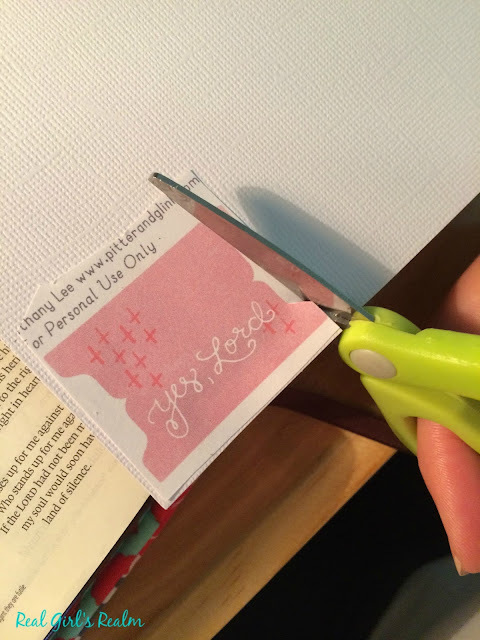 In that post, I mentioned that I use the washi tape to affix printable cards to the Bible pages. Today I am going to share some of the ways I use printables in my Bible journaling. Printables come in a variety of shapes, sizes and styles and are perfect to embellish your page if you are not the best artist. There are cards, tabs, tags, words, shapes, and banners. You can easily find free downloadable printables online. 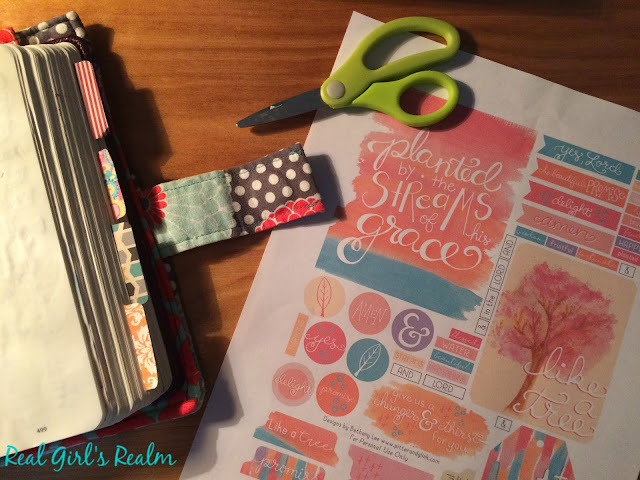 Some of my favorite sites to find printables are Pitter & Glink, Faith in HeART, and My Embraced Grace. 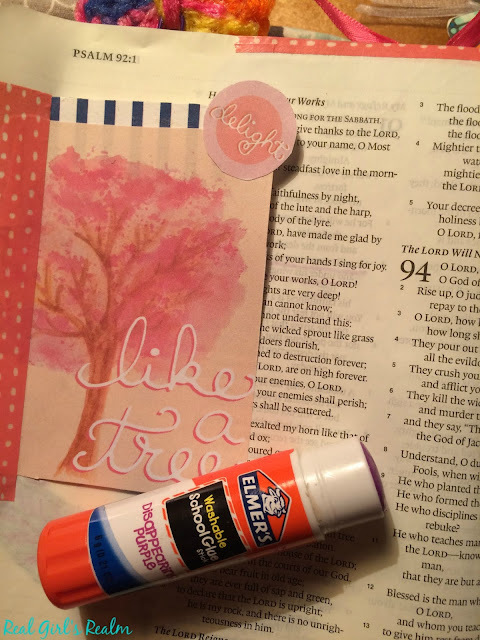 Today I am sharing how I used some of the goodies Bethany from Pitter & Glink created for a "Like a Tree" devotional by Jennifer Hayes Yates. You can print these on regular printer paper or if you want a sturdier feel, you can use cardstock. 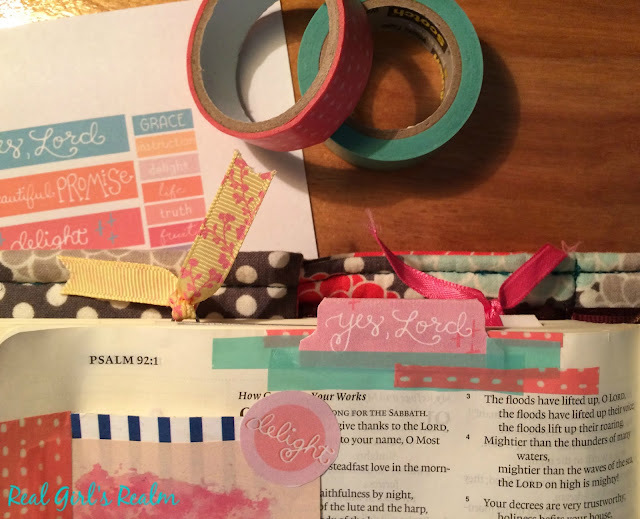 I chose a verse from Psalm 92 to go with the devotional, cut out one of the cards, and used washi tape to add it to the page. Next, I cut out one of the circles and glued it onto the corner of the card for a layered effect. I then glued one of the tabs onto cardstock and cut it out, so I could use it on the top of my page. I secured the tab with several pieces of washi tape on both sides of the page for a decorative look. 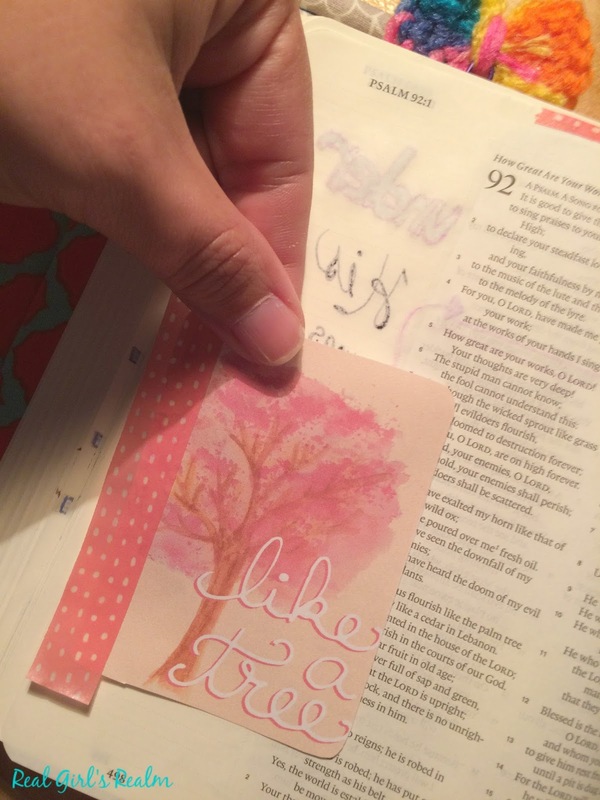 I finished the page by drawing a flower, highlighting the verse, and adding part of the verse using some of the printed words, as well as, my own handwriting. Here is another entry I created using some more of the goodies from the printable page. I hope you are inspired to create your own illustrations using printables! "ESV Journaling Bible, Interleaved Edition - Autumn Song"
Great printables. 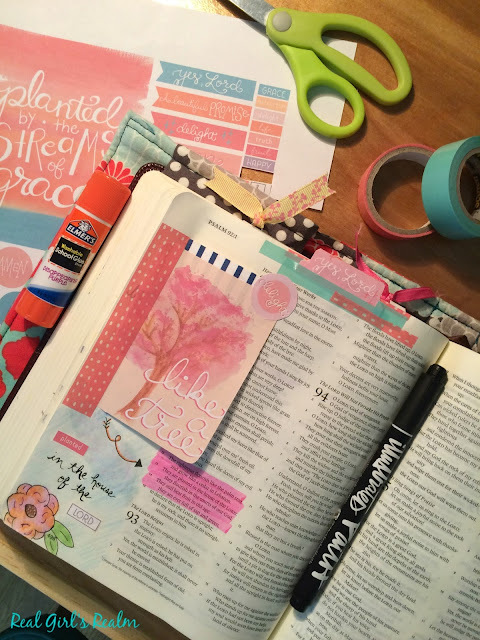 I haven't started bible journaling but these are awesome. Thanks! Pitter and Glink has beautiful free downloads. Oh this is such a fun idea!! I could do.soem of this with my boys I'm sure too! 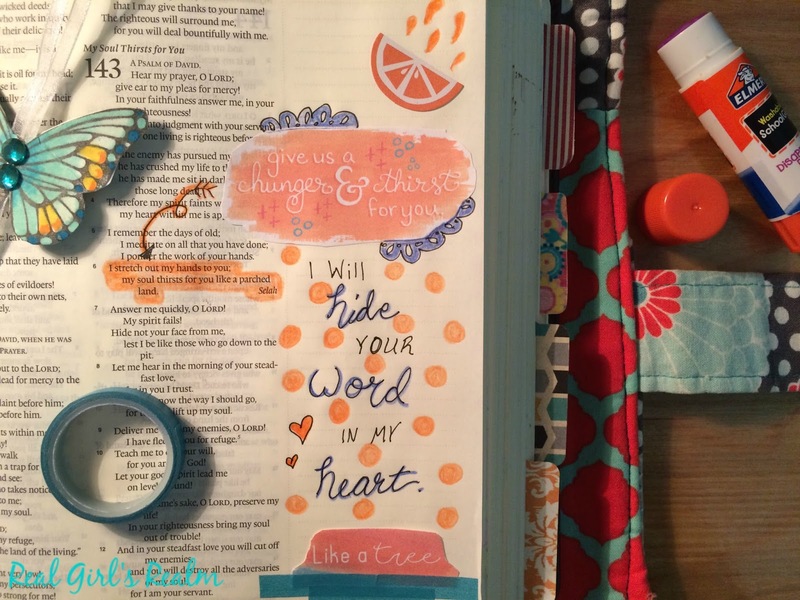 Yes, Bible journaling is family friendly!